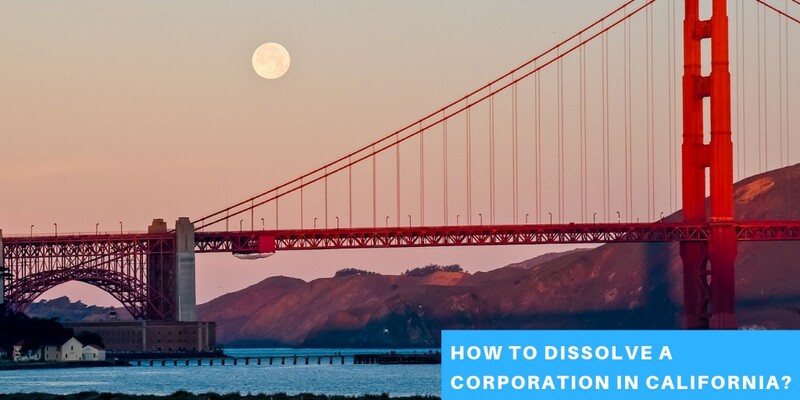 HomeCalifornia CorporationHow to Dissolve a Corporation in California? 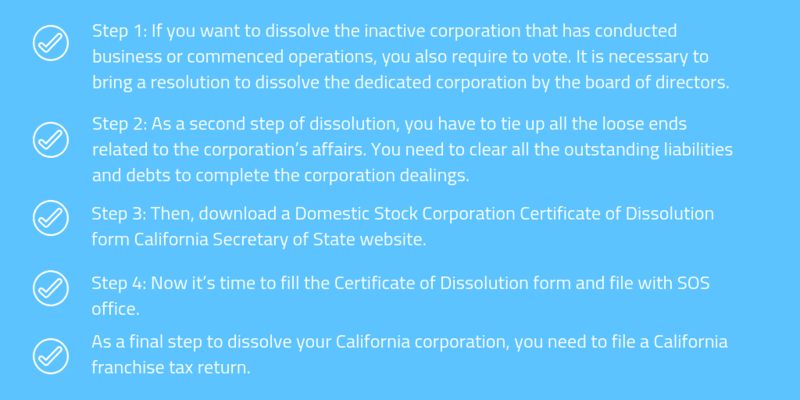 Do you want to dissolve your inactive corporation in California? If yes, then you should know that it also imposes equally important documentation criterion as that of the incorporation of any business. Well, several people usually estimate that an inactive corporation closes down automatically. But it is a myth, in fact, as per the California corporation law, your corporation continues to exist legally by the time you do not file the proper paperwork to dissolve it. Being an independent entity, your corporation has to comply with all state reporting requirements and tax obligations. Until you do not file a formal certificate of dissolution, you need to pay franchise tax each year. So, you have to file the intended dissolution certificate with the California Secretary of State (SOS) and surrender your business entity. Here is the significant information regarding the California corporation dissolution, that may help you. Step 1: The primary step to surrender a corporation is to vote for the corporate dissolution. If as the corporation, you have not yet issued the shares and started the business transactions, you can vote to dissolve the corporation. The voting has to be done within 12 months of filing the articles of incorporation. Furthermore, the dissolution need to have a majority of votes done by all the existing directors. Step 2: Once you have achieved the majority votes from the existing incorporators, you have to wrap up all your outstanding corporate matters. If you have any outstanding amount or debt, you need to clear it at the earliest. You might have a few accounts outstanding to close if you are dissolving your corporation within 12 months, and have not commenced much of operations. Step 3: As the third step, you require to visit the Secretary of State’s (SOS) website to download the Short Form Certificate of Dissolution. It is readily available in the same section whereby you find the regular dissolution certificate. However, you can only download this form, when you have registered the articles of incorporation within the former 12 months. Also, you are eligible to download it, if you do not have any outstanding debts or tax liabilities. The form is available at number 18 in the list of forms. Step 4: Now that you have downloaded the Short Form Certificate of Dissolution, you can complete it and file with the secretary of state’s office. There is no filing fee if you deliver the form at the office by hand. Moreover, you have to receive the two certified copies of the certificate, returned by the state, so that you can keep a record of it. Step 5: As the last step, you have to file a final franchise tax return. It is a very crucial step as your corporation would be permanently dissolved once you return this file with the California Franchise Tax Board. Step 1: If you want to dissolve the inactive corporation that has conducted business or commenced operations, you also require to vote. It is necessary to bring a resolution to dissolve the dedicated corporation by the board of directors. The resolution should be placed in front of all the existing shareholders (with voting stock). You can hold a private meeting or even can ask for written consent from them. Under the California law, it is mandatory to have the least count of 50 % vote count done by the shareholders for dissolution. Further, you should keep the voting information in your corporate records. Also, due to any specific reason, if you miss calling a vote of every shareholder, you have to complete a Domestic Stock Corporation Certificate of Election in lieu of a resolution (for dissolution). This election form can be downloaded from the “Forms & Fees” section of the official website of the Secretary of State (SOS) and file it with the California Secretary of State office. Step 2: As a second step of dissolution, you have to tie up all the loose ends related to the corporation’s affairs. You need to clear all the outstanding liabilities and debts to complete the corporation dealings. Additionally, you should withhold enough money aside to resolve any issue related to contingent liabilities that may arise later. You can also avoid such haphazard situations by placing a public notice in a local newspaper and ask for the claims from the unknown creditors. You can mention a specific time frame for the same and prevent possible issues. Also, distribute remaining money (after debt repayments) and liquidate corporate assets among the shareholders as per their ownership interests. Step 3: After winding up all the possible corporate affairs, you need to visit the California Secretary of State website. Then, download a Domestic Stock Corporation Certificate of Dissolution form. This form is available in the forms and fees section of the website. You just require to reach the website’s homepage and go under the “Business Programs” heading. After that, click on the “Forms & Fees” option, where you would find some more options. Then, you need to choose and click on “Business Entities” and as the last step, click on “Corporations.”For your convenience, if you are looking for the right form, you can look for the form number 17 amongst the list of forms provided. You can file the form in any format abiding by the law of California. Step 4: Now it’s time to fill the Certificate of Dissolution form. This form carries the requirement of filling the information concerning the operative date of dissolution and the verification details of the shareholder’s consent. As a proof, you can either attach the Certificate of Election to Wind Up and Dissolve or state that dissolution was passed. Both the ways are authentic if you file it along with the information of authorized signatories, or get it signed by the majority of directors. You have to file the Certificate of Dissolution with the secretary of state’s office. Therefore, once you have filled the form properly, you can submit it, in duplicate by mail. Further, the state tends to send two certified copies of the certificate of dissolution back to you, so that you can keep it for your records. 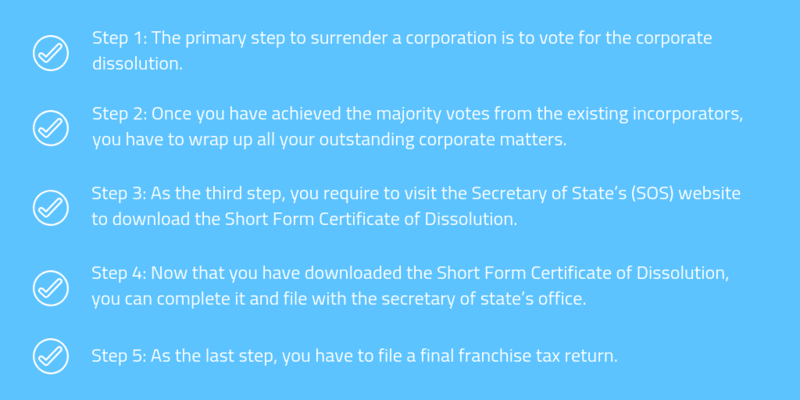 Step 5: As a final step to dissolve your California corporation, you need to file a California franchise tax return. Always remember, if you want to make sure that your corporation is formally dissolved, you have to file this last California franchise tax return with the state tax agency or the Franchise Tax Board. There are certain requirements for the Franchise Tax Board, that you should keep in mind. All the business entities have to file the final current year tax return. The business entities then must go the return first page to review the applicable Final Return box. Here, you need to make sure that you have written the word “final” across the top. After the final taxable year, you cannot conduct business in California. According to the Franchise Tax Board requirement rules, until the enactment of limitations expires, your tax returns would remain subject to the audits. Now, from the above information, you might have understood that the only way to terminate your corporation’s legal existence, as an independent entity, is by filing Certificate of Dissolution with the secretary of the state. Since it takes a lot of efforts to keep all the necessary legal documents and paperwork in place, we have covered all the critical key points for you. If you need further assistance concerning the incorporation and registration of your business you can head toward the IncParadise. We will help you to incorporate your business in the right way by carefully undertaking every required step. For more information contact us now!